Dubai – The son of slain al Qaeda leader Osama bin Laden has threatened revenge against the U.S. for assassinating his father, according to an audio message posted online. 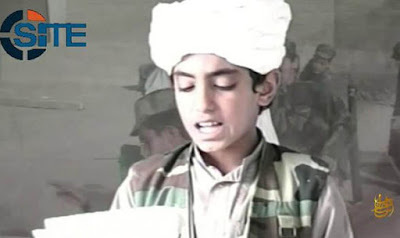 Hamza bin Laden promised to continue the global militant group’s fight against theU.S. and its allies in the 21-minute speech entitled “We Are All Osama,” according to the SITE Intelligence Group. “We will continue striking you and targeting you in your country and abroad in response to your oppression of the people of Palestine, Afghanistan, Syria, Iraq, Yemen, Somalia and the rest of the Muslim lands that did not survive your oppression,” Hamza said. “As for the revenge by the Islamic nation for Sheikh Osama, may Allah have mercy on him, it is not revenge for Osama the person but it is revenge for those who defended Islam. ” Osama bin Laden was killed at his Pakistani hideout by U.S. commandos in 2011 in a major blow to the militant group which carried out the Sept. 11, 2001 attacks. Documents recovered from bin Laden’s compound and published by the U.S. last year alleged that his aides tried to reunite the militant leader with Hamza, who had been held under house arrest in Iran. Hamza provides a younger voice for the group whose ageing leaders have struggled to inspire militants around the world galvanized by Islamic State. “Hamza provides a new face for al Qaeda, one that directly connects to the group’s founder. He is an articulate and dangerous enemy,” according to Bruce Riedel of Brookings.